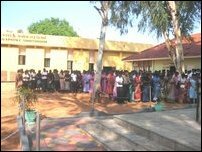 Paintings and cartoons filled book depicting the history of Eelam Wars, "Puyalin Nirangal (Color of tornado)" by artist Puhalenthi was released at the Kailasapathi Auditoriam of Jaffna Campus Wednesday at 3.00 p.m. President of Campus Student Union, C Vijeyaruban presided the event. Vice Chancellor of Jaffna University Professor S Mohanadas and President of the University Employees Union, K Thangarajah lit the common flame. President of Student Consortium, K Kuganendran hoisted the Tamileelam flag. Student at the Arts Faculty Ms Yarlini welcomed the guests. 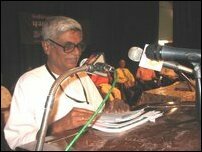 Jaffna district parliamentarian, Mr Eelaventhan spoke about the author and the importance of the book. 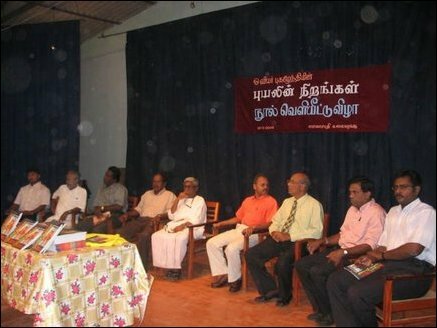 Jaffna Municipal Council Commissioner CVK Sivagnanam released the first book to Head of the Commerce Department of Jaffna Campus, Professor K Thevarajah. Professor of Economics, VP Sivanathan released the special copies to Secretary of Nalllur Pradeshya Sabha, Ms S Theivendram. Principal of Chavakachcheri Drieberg College, Mr K Arunthavapalan and Deputy Editor at Daily Namathu Eelanadu, I Menon spoke at the conclusion of the event.